Repairing Vs Buying Refrigerator: How Do I Know? Repair Vs Buying Refrigerator: How Do I Know? Imagine one of your worst nightmares has come true ­– your refrigerator is not cooling! Would you know what to do next? The first thing you will probably wonder is how quickly you’re going to be able to get it working again so you and your family can continue to eat perishable food. A refrigerator is something you can’t go very long without! Then you’ll probably wonder how much it is going to cost, and whether or not it is worth the hassle. Today we’ve got some tips for you that will help you navigate your refrigeration repairs, and decide when it’s time to call it quits. If your refrigerator is not cooling, there are a few things you can do to troubleshoot before calling a repair company. First, make sure your fridge is properly plugged in. You’ll also want to check the thermostat to make sure it wasn’t accidentally turned down. Check the gasket, or seal on your refrigerator for tears or cracks where cold air may be escaping. Next, check the condenser coils, and if your fridge has one, the condenser fan. If these parts are dirty, it will make it difficult for your fridge to work properly and efficiently. They should be cleaned every three months, otherwise they can become bogged down with dirt, dust and hair. Check out tips for removing dirt, dust and hair here. If you’ve done these things and despite your best efforts your refrigerator is not cooling, it’s time to call an appliance repair company. 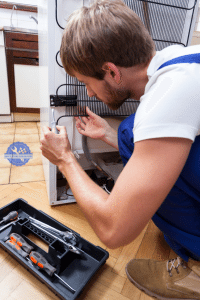 Choose someone like Complete Appliance Repair and Service, who’s professionals will work quickly to get your refrigerator up and running again. But what if your refrigerator is going to require more work than you thought it would to start cooling again? When it comes to replacing your refrigerator, you should consider a few important things; cost, age and type of fridge, as well as energy efficiency. A good rule to follow when it comes to repairing vs buying is the cost. If the repair costs more than half the price of buying a new fridge, you should probably consider getting a new appliance all together. Generally, large appliances like your refrigerator should be replaced every 10 to 15 years. If your refrigerator is built in, it’s going to be cheaper in most cases to repair rather than buy a new one. But if your refrigerator is a side-by-side, it could be worth it to replace if you start having problems after five years. If you have problems with a bottom freezer, or top freezer refrigerators, consider replacing after seven years. Repairing on old fridge might be cheaper than buying a new fridge, but a new fridge could save you on your monthly utility bills by being more energy efficient. If your fridge is especially old, this would be something worth crunching the numbers on. 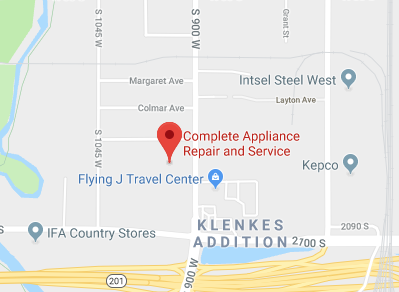 If you’re still having a hard time deciding whether to replace your fridge or buy a new one, call an appliance repair expert like the ones at Complete Appliance Repair for a consultation. This entry was posted in Blog and tagged Complete Appliance Repair, Refrigerator not cooling, Refrigerator Repair on March 9, 2016 by admin.